Your rally fees cover Friday to Sunday morning . that will be at your own expense if you attend,if not your on your own . Please contact Jerry A.S.A.P. he has prepaid deposits for the spots. Jerry would like you to send him a check made out to Jerry Parks for $10.00 to assign you a spot. The check will be returned . Jerry will return your check at the rally if you are able to attend. On October 1, 2018 Compass RV Park will begin taking reservations for 2019. Leatherwood Mountains, an equestrian community is located about halfway between Wilkesboro and Blowing Rock, NC. Leatherwood is actually two parts, the residential entity which is spread over a twenty five hundred acre private development with both stream side meadow properties and high mountain homes sitting on ten plus acre lots with views of forever, and the retail entity, which includes large pastures, barns, riding rings and arena, a string of horses that can be rented to ride the fifty miles of trails within the residential community and restaurant. Call the campground to make your own reservations. The campground is situated in a grove of trees along the banks of a fairly large, mountain trout stream, Elk Creek. The prices for the RV site will be $30. In the Fall 1988 at the GMCMI Convention in Cherokee, North Carolina, Jim and Lou McDowell were dining with Marti and Al Samsel, along with other GMCers from the South. Rossville, GA just south of Chattanooga, TN to hold an organizational meeting of the "GMC Dixielanders" chapter of the Family Motor Coach Association. A charter was awarded on Nov 5, 1988. Come join your fellow Dixielanders to celebrate the 30th Anniversary where it all began at the Holiday Travel Park in Rossville, GA just south of Chattanooga, TN November 1-4 2018. Rally Fee: $25.00 per person. DO NOT FOLLOW YOUR GPS!!!!!!! From I-85, take the Gastonia, exit 17. Turn Left on US 321 toward Hickory. In Lenoir, turn right on Wilkesboro Road, County Road 18. Turn right on Grandin Road. Turn left on Elk Creek-Darby (Citgo Station on the corner). Bear right on Leatherwood Lane. Turn right on Meadow road. or a bit longer way. From I-85, take the Gastonia, exit 17. Turn Left on US 321 toward Hickory. In Lenoir, turn right on NC 268. Turn left on Elk Creek-Darby (Citgo Station on the corner). Bear right on Leatherwood Lane. Turn right on Meadow road. Campsite rates $25.00 per night. Note: If you have Passport America, you can reserve Thursday and Sunday night for $17.50. Make your reservations with Leatherwood by 15 September, 1-366-973-5044. They only have 21 sites with 30 amp service and water. If you are interested in taking a horseback trail ride let them know when you make your reservation. Leatherwood is hosting its first Octoberfest, 14 October, with crafts, hayrides, food and music for campers and community to enjoy. To get in the Octoberfest mood, break out your best German recipes for happy hour, side dishes, and deserts for the potluck meals. Octoberfest activities start at ???? 5:00 - Meet at ???? ?, to get your Octoberfest food ticket (included in rally fee). 6:30 - Ice cream social. 8:00 Continental Breakfast and Happy Trails. Please call and make your own reservation. No Food will be provided, however coffee will be available in the mornings. Dinner will be booked at local restaurants on Thursday, Friday and Saturday nights. Register directly with the Campground. (800) 350-6731 Be advised you MUST register with Lazy Days before December 15, 2015 to be parked with our group of GMCs. 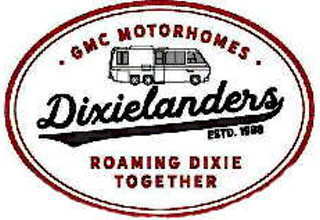 Mention the GMC Dixielanders Rally. Questions? Contact John Richardson @ 850-897-9726 or 850-830-6100. All meals are provided - five(5) from campground-three breakfasts, two lunches and three(3)Catered dinners each evening(Mon.,Tues.,Weds) at 5:30 - 7:00 pm. An area will be available for the rest of the evening for cards and socializing. . Our Business Meeting will be held on Wednesday. at 10:00 A.M.
$237.39 per couple, $187.39 Single. All meals are provided - four(4) from campground and Four (4) Catered meals, Three(3) dinners and a full breakfast on January 21st, Wednesday, prior to our business meeting. (Those not staying at the campground who plan on attending the meeting may enjoy the breakfast with us for only $7.25 tax/tip included.) Dinner each evening at 5:30 - 7:00 pm . An area will be available for the rest of the evening for cards and socializing. The total package costs for entire event, 3 nights camping, all meals, tax and tips included is $ 251.89 per couple, $196.02 Single. Early and late days camping is available at a rate of $41.99 + tax. We will be right there for the 2014 version of the Great Ogeechee Seafood Festival. Prices and schedules as well as other information can be found at the website. Since Friday is our “night out” this might be a fun way to sample some of the local fare. It should be fun. To get to the Seafood Festival (about 4 miles) we will drive to designated parking areas and ride a shuttle to the Festival. Old Town Shuttle comes to the campground at 9:00 AM every morning to take you to downtown Savannah. The shuttle makes its return trip at 5:00. Cost is $28.97 per person and includes a tour of the historic section of Savannah. Make your rally fees check payable to John Nicholls ($25.00 per adult, children are $10.00 each) and mail it to him at 2481 Tate Road, Cantonment, FL 32533 to arrive not later than 4 July. Each coach is asked to bring a dessert which we will split up over the three evening meals. Breakfast will be furnished each day @ 7:30 am and will consist of doughnuts, fruit, coffee and who knows what. Lunch each day will be on your own. Thursday: Meet and Greet @ 5:00 pm (light hors d’oeuvres furnished by club) followed by a potluck supper with meat furnished by the club. Each coach is asked to bring a suitable side dish. Happy Hour @ 5:00 pm followed by a BBQ supper furnished by the KOA folks. The afternoon is free to visit local attractions. Please see separate sheet for details. Diner at 474 Redbud Road and El Pueblito at 206 Park Ave.
Clyde and Faye Simmons who live in Calhoun have advised me that he has a fairly well equipped shop if anyone needs to do emergency stuff. They have also advised of two local sites that are fun visits. The first is New Echota and the second is Chief Van’s home (more details to come). Calhoun is within 100 miles for 8 members, 200 miles for 18 members and 300 miles for 24 members. Ya’ll come. Hope to see ya’ll there. Tthey do have cabins so just have your friends send the rally fee. We look forward to meeting and converting them to GMC owners. The KOA cabins with baths normally rent for $125/night but the rally price is $100 but be sure and identify they are with the rally. See you all at Noccalulu Falls in Gadsden, AL October 17 – 20th. Hosts are the Walters and the Holloways. The package price for two people and one site includes: three nights camping, a welcome fete with heavy hors d’oeuvres and two catered evening meals. This is a no host rally. You must make your own reservations with Lazydays (1-800-905-6627). Early or late camping days are at $42.99 per night and additional people are $42.06. Cutoff date for registration is 14 December 12. All prices are plus tax. Cancellation between 14 December 12 and 6 January 13 will cost you a one night site fee. After 6 January, you will forfeit the entire registration fee of $220.00. Please notify John Nicholls at johnrita1@cox.net when you reserve so we can keep up with the number of attendees. A business meeting will be held on Tuesday the 15th at 10:00 AM. Anyone not staying at the park but close enough to travel is encourage to attend the meeting. Life Play of Georgia. Its business is storytelling! True local stories are spiced up with songs written by local musicians and costumes of an era gone by. It’s a helpin’ of down-home Southern flavor. Not just a “local hoe-down”, it has been performed at the Kennedy Center and other locations to great acclaim. We have 40 tickets reserved but they must be paid for or returned by 15 August. If handicapped seating is needed, I will try to make those arrangements; you will have to let me know as soon as possible. Additionally, Colquitt has a very rich and interesting history with many places to visit. Colquitt is on US 27, 60 miles North of Tallahassee, FL. We will be staying in the City Park, within walking distance of almost everything in town, including the town square and the theater. The large commercial RV park where we planned to stay has been closed. Therefore, we have reserved Colquitt’s Spring Creek RV park, and obtained permission to park in the adjacent City Park. The RV park has only 7 sites, all with full hookups, at $15 per night. The City Park has a large level paved parking lot, with restrooms, a small covered pavilion, and a nice boardwalk leading through the swamp to the creek. There MAY be some 15A electrical connections but no other hookups. There will be no charge for dry camping there – just leave it cleaner than we find it. The weather in early October should be pleasant enough for dry camping. There will be no generator restrictions imposed. Dumping can be done in the RV park if necessary. We will reserve the RV park for those whose physical condition requires hookups; if those individuals do not reserve all of the 7 sites, the excess will be available to others in the order their registrations are received. Spring Creek Park is located at the western city limits of Colquitt on US-27, just east of Spring Creek. The street immediately east of that park leads to the City Park; GMCDL signs will be posted. Includes: 3 nights of camping, welcome reception, 2 catered dinners . A complimentary breakfast will be available across the street. Some evening entertainment/band is planned. Make your own reservations with the park – make sure to tell them you will be with the GMC Dixielander/ Alumni group. This is a dual club rally. Meeting room provided by KOA for activities/games. Attendees are responsible for making their own reservations no later than 1 July. Make reservations directly with the RV park. Lets have a massive GMC rally at this FMCA event! As I'm sure you all know, FMCA has been trying to persuade more GMCers to attend their conventions. Americus, GA is only 45 miles SW of Perry. 12 miles west of here, my aunt has a 249 acre "play farm" ( http://goo.gl/N89IA ), mostly wooded and hilly, with a cabin, two fish ponds, a barn, and plenty of parking for as many GMC's as we're likely to be able to round up. My proposal is that GMCers gather there a couple of days before FMCA starts, say beginning on March 11th. There are plenty of attractions in the area, such as Jimmy Carter's home town, the National POW/MIA museum at the infamous Andersonville Cemetery, and a great aviation museum at Robins AFB. Or we can just fish & jawbone. On March 13th or 14th (to be coordinated with FMCA), we'll caravan the 53 miles to Perry and make a Grand Entrance -- ensuring that we're parked together. By mid-March we typically have very pleasant weather and Spring is just about to burst forth so it should be an ideal time for the dry camping the lack of hookups will impose. This is an unusually good opportunity for the GMC community to make an impression on the larger motorhome community and to gain publicity for our old coaches. All as a bonus while we're having fun! My request to all of you is that you publicize this proposal and encourage everyone to attend. Even some GMCers in the far West and Northwest may find themselves over this way and able to attend. It will be most helpful to me in planning and coordinating with FMCA if everyone interested in joining us at the farm will let me know. An email with the subject "FMCA" to ken0henderson at gmail. com (that 0 is a zero) with arrival date will suffice. I'll confirm the plan and provide directions early next year -- directly to those who contact me. Report::Date: Wed, 24 Sep 2008 21:43Here we are with 19 coaches near Bristol, TN, having a great time, as illustrated in Chuck Boyd's photos. Today we toured the Bristol Motor Speedway. Very impressive. Since I'm not a NASCAR fan, I had no idea that this 0.5 mile + 74 yards track was surrounded by a 182,000 seat stadium. Largest in N. America and 4th largest in the world! Can't imagine 43 cars running around in that bowl. Nor the 120 db noise level they create. Had lunch at, and a tour of a large Bristol-based charitable organization which redistributes cosmetically damaged and other contributed medical supplies, clothing, food, etc., around this area and 100 missionary-visited countries.This evening we all went to an excellent local restaurant. All-in-all, a most enjoyable social event thus far.Tomorrow, after a full catered breakfast, we'll have the business meeting followed by a tech session, with the ladies excused for sightseeing and shopping in historic Bristol.Our CV-joint plagued member did a test drive today and came back delighted. Even with the blue coating gone from his steering coupler, he reports much better steering. About 3/4" steering wheel play at the rim. Hopefully he'll be able to get a replacement at Harrington. The GMC Dixielander Summer Rally is scheduled for July 24 thru 26, 2008, at the Peace Valley Campground, Murphy, NC. The park has a limited number of sites, and we have reserved 30 for the Dixielanders. But, each attendee must make their own reservations with the campground. The park will hold the 30 sites for us until June 1st. When you contact the Park, please identify yourself as a “GMC Dixielander”, to obtain the negotiated rate of $20 per night. These rates are also good for early arrivals. Imposed by a very busy campground. If you wait, there will be no room. It was a success !! Wednesday, April 30 - gorgeous day. What a day for the 1st trip of the season from NW Ohio to Bean Station with the new tires, new AE wheels, new shocks and all new bearings in the rear wheels. The 455 was purring like a kitten with Mr. Paterson's newly rebuilt distributor. This was what it was all about.The day before, I took one more look at the engine to verify all connections, and something reminded me of a member's picture showing a gap between the drive axle flange and the final drive - so I looked. Sure enough, on the driver's side, a 1/8" gap. A check of the six bolts revealed they were all finger loose. These bolts had a hex head, the other side had the OEM 12 point bolts. Got them tightened (with new lock washers), good to go.About 50 miles out, we re-torqued the new wheel lug nuts. We were heading for Cincinnati with a stop for lunch with Bob Burkitt, and to pick up some items he had for us, including six new Cinnabar flange bolts and lock washers I had emailed him about. After lunch, and a stop at Sears for a new torque wrench (old one gave up the ghost just before Cincinnati) we were on our way again.Then the day turned cloudy for us. A slight vibration was telling me that there might be a problem with the front end, but we pressed on. It got worse. By the time we hit Corbin, KY, the vibration had turned into a full-fledged side-to-side shaking. It was so bad, it literally almost threw us out of the seats. This only happened during acceleration, and after reaching any speed and letting off the gas, it would be as smooth as glass. Push on the gas, and it shook. After we called Bob B., and discussed options, we decided to try for Bean Station. It was late in the day and we had some good hills before us.About 20 miles out, we called Al Samsel to tell him we were coming, but limping in. That was a good move as when we got to Bean Station, JR put us in the covered area where Eric Tanner had been with his problems the year before. We called it a night. HA! At 11:30pm, the cell phone rang and a voice says: "John, this is Ken Burton - I'm on the phone with Bob Burkitt and I hear you've got a problem". He was in his Blazer going around Indianapolis. The three of us conferenced for a half hour and Ken decided to change his route and go to Cincinnati and pick up some parts that might be needed to repair whatever was wrong with our coach. The next morning, Thursday, we moved into the pit building.If we thought that phone call was amazing, what happened next was also. At some early hour, our coach was inundated with people willing to do whatever was needed to solve the problem. Bill Bramlet led the charge, with pit boss, Ron Davis, Eric Tanner, and Tom Phipps right behind him. John Nicholls pitched in, as did many, many others.It was determined that some of the cv joints were gone. The spindle nut on the passenger side was removed with the obligatory breaker bar and cheater. The same nut on the driver's side was removed with Ron Davis' hand! One inner cv joint was bad on one side and the outer joint was gone on the other side. The driver's side hub and knuckle were shot (knuckle had been pin punched on the inside by some PO or their &#8216;mechanic'). Luckily, JR had a rebuilt hub and knuckle with him. One of the three balls on the bad inner joint was chipped around the ball opening and the needle bearings were no where to be seen. Howard,We enjoyed parking by you at Bean Station and talking with you. Your coach was a rare find. Every one who saw it was impressed. I don't know what it about a GMC but some of the most interesting people I have ever met seem to have one and it is not just the Dixielanders. We belong to 6 chapters and every one of them are full of interesting people if you take the time to talk with them. The International rallies are great to meet new people and see old friends from all over the country and world. We look forward to seeing you all at more rallies. Generally, anyone who owns, or is in the market for a Class A GMC Motorhome and intends to use it at club events is welcomed to be our guest. We are sure, that after you experience the camaraderie, fellowship and immense collective knowledge of this group, that you will be inclined to become a member and help support our club and it's activities. Dues are only $20 for the first year and $10 a year after that. The Dixielander Newsletter alone is worth that.